Cosmic rays attack! Sort of. Get out your tinfoil hats: cosmic rays, high-energy protons and heavy nuclei from the great beyond, are at a fifty-year high this month, according to NASA. "In 2009, cosmic ray intensities have increased 19% beyond anything we've seen in the past 50 years," says Richard Mewaldt of Caltech. "The increase is significant, and it could mean we need to re-think how much radiation shielding astronauts take with them on deep-space missions." So do you need to worry? Not unless you're an astronaut or a satellite. Cosmic rays constantly bombard earth's atmosphere at a rate of about 100 per square meter per second, but they don't make it through intact. They collide with atmospheric molecules, setting of a cascading shower of secondary particles, such as neutrinos and muons. Researchers probably wish there was less stuff between us and them; because they're messengers from the deep, so to speak, they could offer clues to black holes and supernova. But most of what eventually reaches the ground is very low in energy; above the energy of 10^20 eV, only one cosmic ray falls on a square kilometer of ground in a century, meaning that cosmic ray observatories must span huge swaths of land. The Pierre Auger Observatory, an array of 1,600 water tanks on the Argentine Pampas that catch the secondary particles and confuse cows, covers an area greater than that of Paris. One of Pierre Auger's water tanks on the Argentine Pampas. The cosmic ray bounty, however, wasn't detected by Pierre Auger. The Advanced Composition Explorer spacecraft, orbiting around an Earth-Sun gravitational equilibrium point nearly a million miles from Earth, collected the bumper crop, which is apparently due to the a serious slack in solar activity since 2007. The sun's magnetic field, expanded by the solar wind, form a magnetic shield around the entire solar system, called the heliosphere, and usually deflects intergalactic intruders. The interplanetary magnetic field is about half as strong as usual, the solar wind pressure is low and the heliosphere's current sheet, where the magnetic field's polarity flips, has gone a bit flat. Charged particles move along the lines of this sheet, so a flatter sheet provides a more direct path for cosmic rays from the edges of the solar system to earth. An artist's rendering of the heliospheric current sheet. In Paris, the Montparnasse Tower will be converted into a temporary cosmic-ray detector, honoring the city's historical affiliation with cosmic ray research. In the early part of this century, a Dutch Jesuit priest named Theodore Wulf trundled around Europe with an electroscope, measuring the "mysterious radiation" at various altitudes. His research took him to the Alps, the top of the Eiffel Tower, and aloft in balloons, and influenced cosmic ray pioneer Viktor Hess. There are people who do Civil War Reenactments. And then there are these guys. 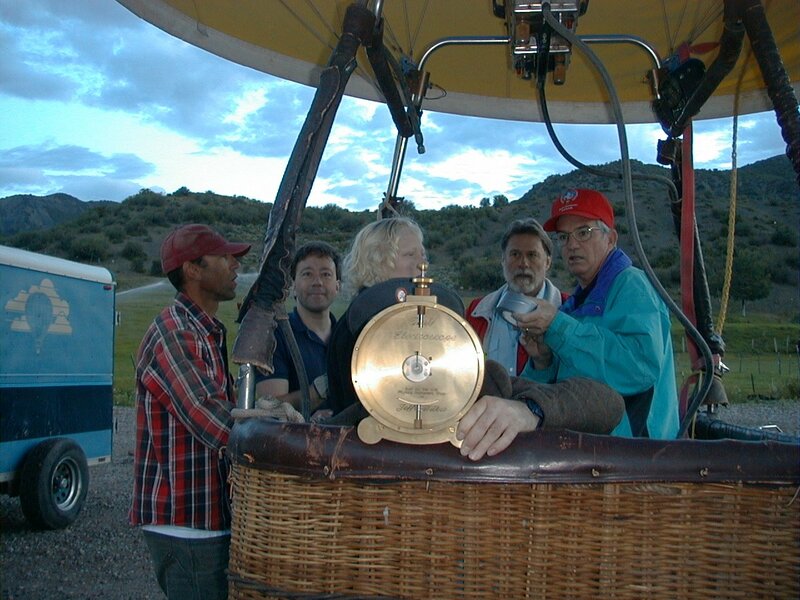 If that's not exciting enough for you, you might want to get in contact with Greg Snow of the University of Nebraska and Jeff Wilkes of the University of Washington, who reenacted Viktor Hess's balloon flights for the 90th anniversary of his experiments. In "Poussières d'étoiles" the book of Hubert Reeves, it is possible to read that cosmic rays are the cause of some genetic mutations which are a cause of evolution. Thus may be some babies in formation will be touched by them in the way of evolution. I just have to put in this plug, these guys would look so cool with a Space Invader bag! !